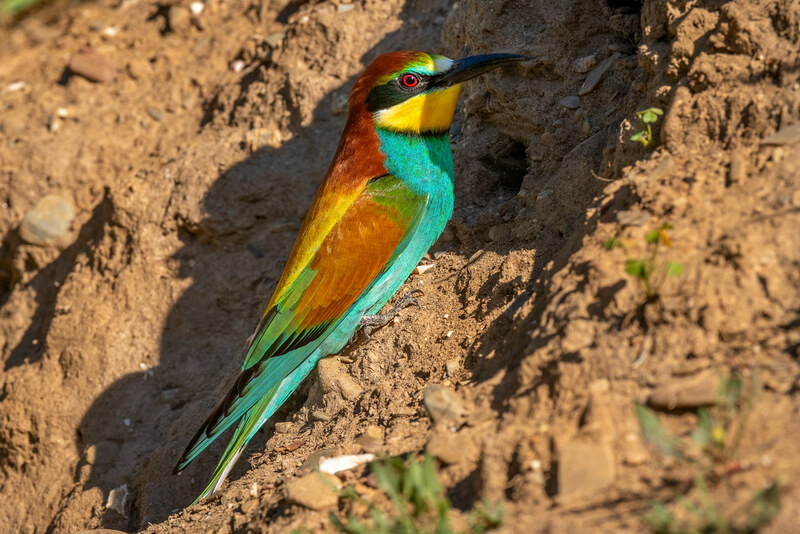 To be honest, they have been back a while and it seems that all around the Algarve they appeared much earlier than their usually late Spring arrival. We’ve been lucky locally as while a lot of the Algarve is having rain, we’ve had a patch of clear blue sky above the Quinta most of the day. 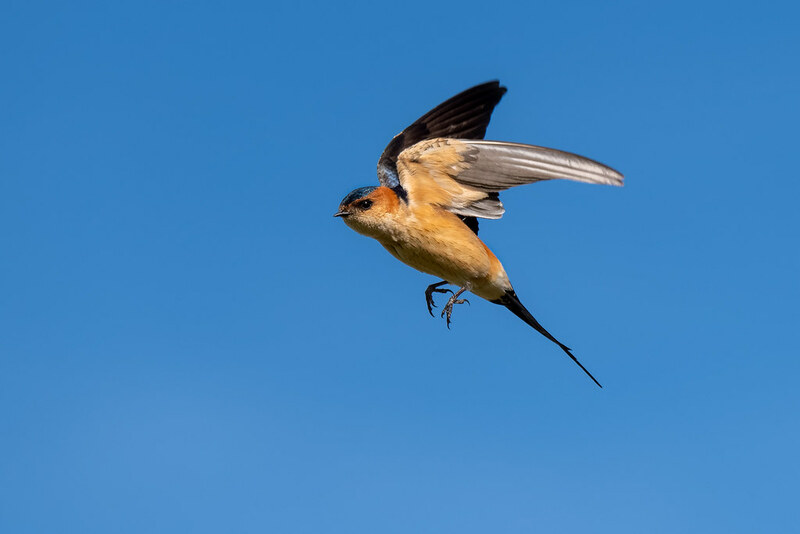 The Red-Rumped Swallows are of course out hunting on the wing and I took a break from gardening duties to capture some with the camera. I’ve been so carried away with all the activities of Springtime that I have not taken any “Artmospheric” shots lately. Yes, that’s a word I made up! 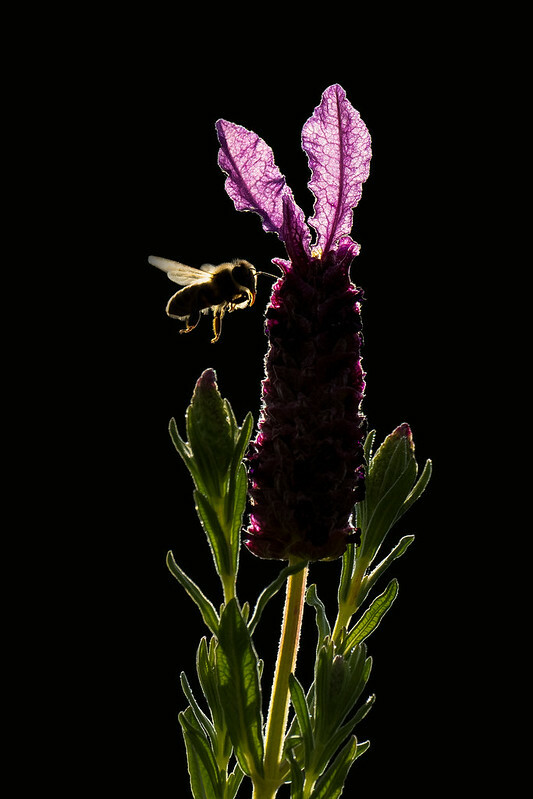 So this morning I waited patiently at this French Lavender Flower that was nicely backlit by the sun with a great dark canvas provided by a distant Eucalyptus Tree that was in the shade. I didn’t have to wait too long (thankfully for Wally’s sake who was getting bored!) until a Honey Bee turned up and managed to shoot this photo. This has kicked started me to take more “Artmospheric” shots and hope to bring you more soon! Every week I choose one of my favorite images available to purchase in the Shop and feature it, this week is a photograph of a White Stork silhouetted by an amazing orange sunset. This photograph was taken in January 2018. Silhouette photos really work when you can instantly recognise the subject. This photo is iconic Algarve. 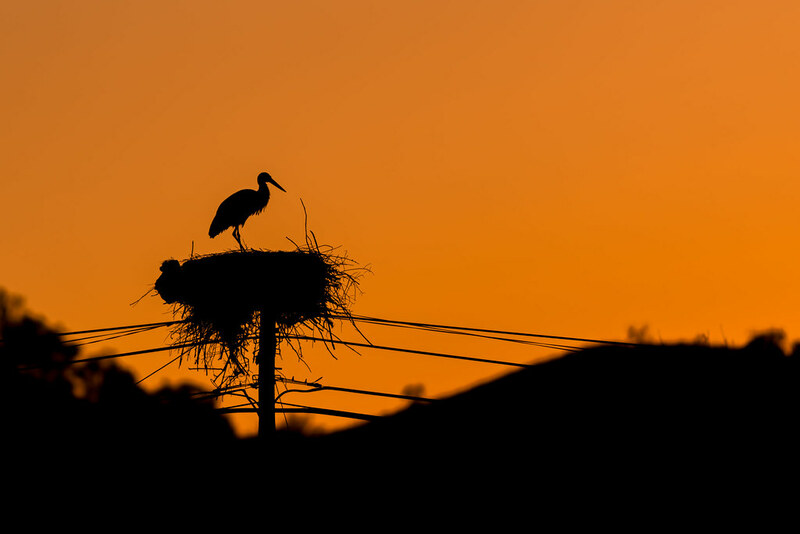 It features the amazing backdrop of a colourful sunset with an easily recognisable Algarve bird, the White Stork standing on its nest on an electricity post. It was taken in my local village of São Marcos da Serra using a long focal length to highlight the effect of the bright orange sky. The huge contrast between the orange and black makes it look amazing in print. I don’t normally photograph plants and flowers but the overcast and rainy day gave my favourite light for flowers as I think it adds a nice mood and really helps with the “highlights” not being too bright. 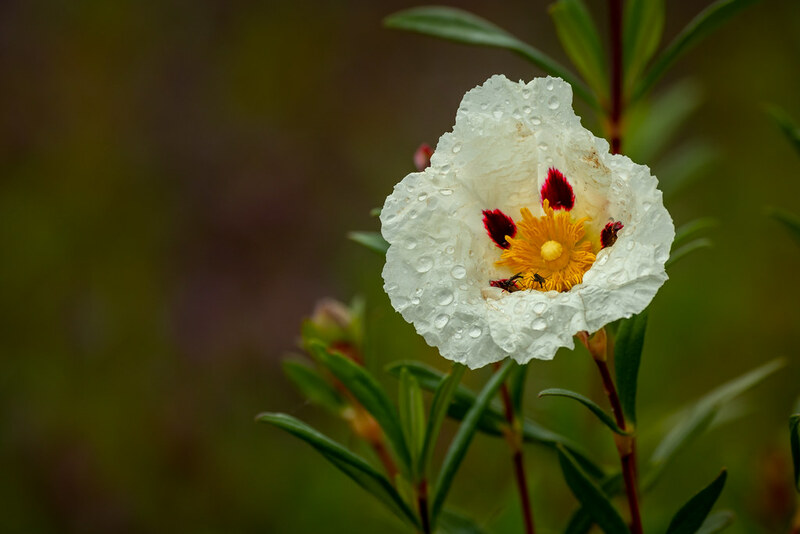 The hills are covered in flowering Esteva (known in English as Gum Rock Rose) and I love the way the rain drops sit on the petals. The Esteva plant smells amazing due to the resin in the plants, but of course this resin in flammable which doesn’t help with the summer fires. It used to be used in the production of perfume, but these days it’s mainly used for starting fires in the winter as it makes great kindling. I also use it to start my BBQ! 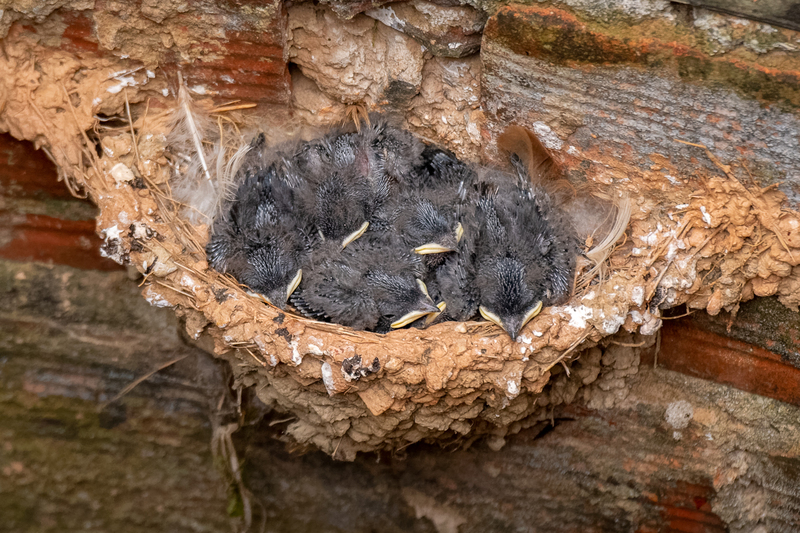 Originally, I thought there were just 3 Barn Swallow Hatchlings in the Well Nest (See Blog Post), and then I counted 5. This morning, I took a look to see how things are going and there’s 6 of them in there! As you can imagine, light is a bit rubbish down inside the Well which makes it difficult to photograph the parents feeding them. However, the construction of the Well and the pump house makes a perfect hide. I am able to sit lower down in the pump house and use a small window to look directly at the nest without being seen or disturb them. The Well is owned by my neighbour and I will be asking him for the key to the pump house to try to bring you some shots of them being fed! This morning I awoke to thick hill mist but knew as soon as the sun peaked above the ridges it would burn off quickly. I didn’t really have a plan with so much going on around the Quinta. I knew the Bee-Eaters wouldn’t be around until the mist completely cleared so headed briefly down to the Kingfisher perch. I stayed for an hour but none appeared and soon enough I heard the Bee-Eaters waking up. I headed to the location where they have started to build their nest tunnels and set myself up inside a large bush camouflaged out of sight. These long tunnels keep the eggs (can be up to 8!) safe from predators. It’ll take them a while to dig the tunnel in preparation for laying at the beginning of June. I tried something new this morning as not to scare them away. I used the Nikon D850 in live view mode with silent shooting. The D850 actually is totally silent in this mode. I’m not a big fan of the D850’s live view autofocus and rarely trust it, but it seemed to do the job OK, albeit not as pin sharp as it should be.